Is Your So-Called Good Diet Slowly Killing You? Even if your total cholesterol level is perfect, it may not shield you from a heart attack. Carbohydrates can be just as harmful as red meat or butter. A diet high in "good" fats (as much as 40 percent of calories) is actually better for you. The Zone diet, the Atkins diet, and the American Heart Association diet can each be dangerous under certain conditions. The failure of insulin, the body's "sugar cop," to process blood sugar is the key to Syndrome X. The Syndrome X diet and exercise program will keep you healthy and protect your heart even if you do not suffer from insulin resistance. Tested in carefully controlled research settings and in practice, the Syndrome X program is safe, effective, and easy to follow. Bob's life began to unravel one night after he and his wife, Eleanor, finished a healthy, home-cooked dinner consisting of fresh sea bass, spinach salad, baked potato and asparagus tips, topped off with low-fat carrot cake to celebrate Bob's fifty-eighth birthday. Fish, vegetables and low-fat dressing on the salad: just the low-fat diet the doctor recommended. Later that evening Bob took the couple's terrier, Cargo, out for an evening stroll. The birthday boy was looking forward to breathing in the crisp San Francisco air, but he also felt a little tired. And as he and Cargo headed toward the park he began to feel a slight pressure in his chest, right beneath his breastbone. Thinking it might be indigestion, Bob forced a burp to relieve the discomfort. Later, at the park, Bob was still aware of the uncomfortable heaviness in his chest. He had suffered from indigestion before, but this sensation was somehow different and frightening. Unwilling to admit that he was scared or that the nagging pressure was growing worse, he decided to wait it out. Eleanor peered over her magazine when Bob came back. "You look a little tired," she said. "Why don't we both turn in for the night?" "I'm OK," he replied. "You go ahead. I just need to belch but can't quite make it. I think I'll take something to settle my stomach. As soon as it goes away, I'll be in." Quickly downing a bromide, Bob sat down on the couch with a newspaper. Within a few minutes he felt a thin layer of perspiration on his forehead. As he drew his handkerchief across his forehead, he thought about his father's fatal heart attack at age sixty-one. It came as a complete surprise to the family because his father had no history of heart problems. Two years later, his father's brother Roy suffered a mild heart attack, living only four more years before dying of a second attack in his sleep. Fighting back his anxiety, Bob tried to reassure himself. "I hardly eat any saturated fat," he thought, "My cholesterol is low; I haven't smoked in years. I could lose a little weight, and my blood pressure may be a little high, but overall I'm in good shape." He settled back with his newspaper, but the feeling of pressure in his chest was getting worse, and his growing sense of fear made it hard to concentrate. Finally, a few minutes after midnight he went into the bedroom. "Eleanor," he said, grim faced, "I know this sounds crazy, but I think I'm having a heart attack." Instantly awake, Eleanor bolted upright. She gasped when she saw Bob standing by the side of the bed, pale as gray-tinged ice. In the emergency room, a physician questioned and examined the frightened man, then ordered an electrocardiogram and a blood sample. Although the tests were inconclusive (several hours may pass before tests can confirm a heart attack), the doctor kept Bob in the coronary care unit overnight to monitor his heart, and repeated the tests in the morning. Then Bob received the terrifying news: he had indeed suffered a heart attack. No longer fearful, Bob was incredulous?and angry. "Maybe I don't exercise enough and I've gained a few pounds, but I religiously follow a low-fat diet. How could I have had a heart attack?" The doctor could only shrug, saying, "I really don't know. Some people, lots of them, eat what should be healthy diets and have normal cholesterols, but still have heart attacks." rNeither the patient, his wife nor his doctor knew that Bob was a victim of Syndrome X, a silent condition that often triggers "the heart attack that shouldn't have happened." There's good news and bad news in the battle against heart disease. The good news is that thanks to better methods of diagnosis, plus new drugs and surgical techniques, we can detect heart disease much sooner than ever, relieve chest pain and shortness of breath related to heart disease, bypass clogged coronary arteries, effectively treat people who have survived heart attacks and even, in some cases, stop a heart attack in progress. The bad news is that despite these tremendous technical advances, despite emphasizing good nutrition for two decades, despite lowering our cholesterol levels and cutting fat from our diets, we're still likely to develop heart disease and die of heart attacks. Heart disease remains the number-one killer in this country. Millions will fall prey to a fatal heart attack, many dying without any warning whatsoever. Every 20 seconds, someone, somewhere in America, has a heart attack. And every 34 seconds, someone dies of heart disease. Why? We have powerful drugs to lower cholesterol; high-tech coronary care units place tremendous amounts of technology at the disposal of doctors treating heart patients; triple and quadruple bypass surgeries to restore blood flow to the heart are now routine. Most everyone knows they should protect their hearts by eating a low-fat, high-carbohydrate diet, and exercising regularly -- and many of us do. Why, then, are so many of us still dropping dead of heart attacks? The problem lies in a little-known but very common metabolic disorder called Syndrome X. If you have Syndrome X, your coronary arteries are under attack. These arteries, which bring fresh blood to your heart muscle, are being "cut" and "wounded," are filling with "scabs" and cellular debris, are slowly being dammed up and closed off. This quiet malady's most direct effect is to interfere with the ability of insulin to move glucose (sugar) into certain cells for later use. Unknown millions of heart attacks have been caused by the failure of insulin, the body's "sugar cop," to do its job. This means that, for tens of millions of people, cholesterol is not the underlying problem leading to heart disease. And that's why, if you have Syndrome X, simply lowering your total cholesterol or LDL "bad" cholesterol is not enough to shield you from a heart attack. 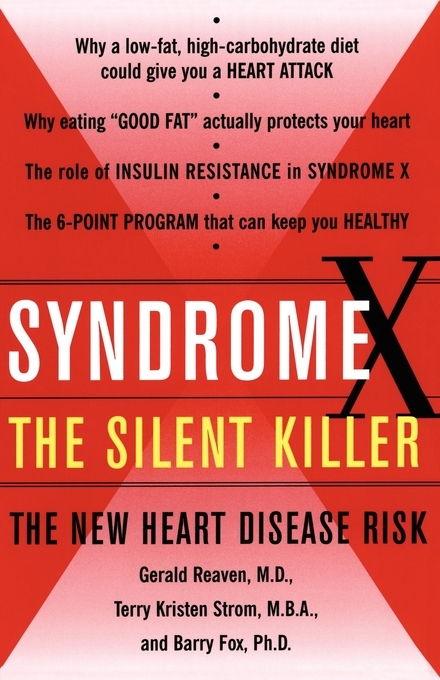 Even stranger, to most people, is the idea that one way to guard against Syndrome X is to ignore the "best" medical advice, to shun the low-fat, high-carbohydrate diet everyone "knows" is good for the heart. If you have Syndrome X -- and 60-75 million Americans do -- that "good" diet can be deadly. If you have the syndrome, carefully dieting to lower your total cholesterol or LDL cholesterol won't solve the problem. In fact, conscientiously doing so may make a heart attack even more likely. We don't know exactly how many hearts have been attacked by Syndrome X, although it may be responsible for as many as 50 percent of all heart attacks -- or even more. Unfortunately, very few people are aware of Syndrome X, know whether or not they have it or are doing anything about it. And their doctors aren't telling them. This deadly heart ailment begins in the bloodstream, shortly after we eat. That's not a startling idea, for we know that eating fatty or cholesterol-laden foods can be bad for our hearts. However, the Syndrome X culprit isn't red meat or butter, it's carbohydrates. Yet these carbohydrates are reluctant, inadvertent offenders. Before entering the body proper, our food is broken down into various constituent parts in the intestine. One of these is glucose (blood sugar) from carbohydrates. Upon entering our cells, some of the glucose is put right to work providing the energy that cells need to perform their various tasks. The rest is stored in certain cells for later use. But the glucose doesn't simply flow into the storage cells. Instead, it must be guided in by insulin, a protein secreted by the pancreas. Insulin acts like a shepherd, herding its precious flock into the cellular "corrals." Unfortunately, in many of us, glucose behaves like a group of errant sheep, stubbornly refusing to go where the shepherd directs. When that happens, the pancreas pumps out more and more insulin. That's the biochemical equivalent of sending out more and more "shepherds" to get the "sheep" into the "corrals." Imagine hundreds of shepherds chasing thousands of sheep across a pristine field covered with thick, beautiful green grass. Those hundreds of feet and thousands of hoofs will quickly tear up the field, ripping out or flattening down clumps of grass. Soon, the field that once looked so green and lush will be trampled and scarred, brown and dirty. Something similar happens inside your body when glucose refuses to move into the storage cells at insulin's command. The interior linings of your arteries, like the grassy field, are "ripped" and "trampled" as the body attempts to overcome this problem. Eventually, the insulin "shepherds" corral the glucose, and order is restored in the body. But all is not well, for the "field" (the lining of your coronary arteries) is damaged, and there's other damage, as well. This damage sets the stage for heart disease. Excess insulin in the bloodstream prompts the damage associated with Syndrome X, but the insulin is only trying to do its job. The underlying problem is insulin resistance. About 25 to 30 percent of Americans are resistant to their own insulin -- their "shepherds" are simply not strong enough to properly herd glucose. This means that greater amounts of insulin are required to get the job done. Unfortunately, excess insulin is the first in a series of events which triggers the damage to arteries that may precipitate a heart attack. Insulin resistance is at the heart of Syndrome X. That's why simply lowering total cholesterol or LDL "bad" cholesterol won't solve the problem. And that's why the low-fat, high-carbohydrate diet so highly recommended by most physicians and health organizations is so dangerous for those with the disorder. Remember, carbohydrates become glucose, and glucose must be herded into certain cells. That requires insulin. More carbohydrate equals more glucose equals more insulin: that's the formula for disaster for those with this "unknown" syndrome. Up until about ten years ago, insulin resistance was recognized as a malady which, if not compensated for, could lead to type 2 diabetes. Thanks to thirty years' worth of research into Syndrome X, we now know that even if you never develop diabetes, you can still suffer other ill effects from insulin resistance and high insulin levels: you may suffer from a constellation of changes that greatly increases your risk of coronary heart disease. In short, if you are insulin resistant, you are in real trouble. Who Is Likely to Develop Syndrome X? Syndrome X is not an exotic disease visited on a few genetically unlucky people. Between 60 and 75 million of us are insulin resistant. A small percent of those millions, perhaps 5 to 10 percent, will develop Type 2 diabetes because their pancreases simply can't produce enough insulin to overcome the insulin resistance. The pancreases of the remaining people will furiously secrete insulin until the resistance is overcome, thus setting the stage for heart disease. Although we haven't yet mapped out all the genes responsible for triggering Syndrome X, we do know that there must be abnormalities in several genes before the disease can manifest itself. We also know that ethnicity plays a role, with people of non-European origin being at a much greater risk. Family history also factors into the equation, with your odds of developing Syndrome X increasing substantially if you have a family history of diseases related to insulin resistance, such as heart attack, hypertension and type 2 diabetes. Lifestyle factors are apparently as important as the genetic: improper diet, obesity, lack of physical activity and cigarette smoking worsen Syndrome X. The fact that our behavior plays a role in the syndrome is good and bad news. We can't alter our genetic heritage, but we can change our diets and daily habits. The more of these risk factors you have, the greater your odds of suffering a heart attack. This standard list of heart disease risk factors is a good start, but it's missing a vital ingredient. The list is inadequate for those with Syndrome X because it does not address insulin resistance or compensatory hyperinsulinemia (excess insulin) and their consequences. Notice the differences. The Syndrome X heart disease risk factor list includes the rate at which fat clears from the blood, not just the amount of fat in the blood. It also considers the formation and clearance of blood clots, and the physical characteristics of LDL cholesterol (not just the amount). Just how important are the Syndrome X risk factors? Several studies have shown that a low HDL cholesterol, a central feature of Syndrome X, is at least as powerful, if not more so, in increasing risk of heart attack as is high LDL cholesterol. Studies have shown that every separate component of Syndrome X is an individually significant heart attack risk factor. That means that the more components of Syndrome X you have, the greater the heart attack risk. The most reputable research studies reflect this profound fact. For example, the Quebec Cardiovascular Study found that for each 30 percent elevation in insulin levels, there was a 70 percent increase in risk of heart disease over a five-year period. The risk increased with each added component of Syndrome X. The best way to prevent Syndrome X is to choose your parents carefully. After all, if you have a family history of heart attack, you run a greater risk of having one yourself. But since the wonders of modern biology have yet to give us the option of choosing our parents, we must find a more practical solution. There are numerous heart attack prevention programs and diets. But none of them gives you the complete and effective approach that attacks all risk factors simultaneously, for none deals with Syndrome X and insulin resistance. In fact, much of their dietary advice makes the syndrome decidedly worse. The solution to Syndrome X is based on rigorous scientific research. It is safe, effective and very easy to follow. The dietary changes require only slight adaptations for most people, who are delighted to learn that the Syndrome X Dietª allows significantly more fat than the standard "heart healthy" diet. This means that your health-enhancing diet actually tastes good! Since it's nutritionally balanced, all family members can share the same food, even if they don't have the disorder. The nondietary facets of the program are equally practical and easy to do. Syndrome X is a complicated disorder, making it impossible to devise a magical "one size fits all" cure. Nonetheless, it's relatively easy to identify your practical needs and the ideal solution. Your particular strategy will be based on your laboratory results. Which strategy you adopt depends on how many aspects of Syndrome X you have, and how severe they are. It's possible to have developed all aspects of Syndrome X, or only one or two. Some people suffer from all the manifestations at severe levels, some develop one or two at a slight level and others land somewhere in between. The more Syndrome X risk factors you have, and the more severe they are, the greater your risk of having a heart attack. But even if you are only standing on the precipice of Syndrome X, adopting and maintaining a preventive program now will greatly enhance your heart health for the rest of your life. Having a safe and effective plan for yourself has psychological as well as physical benefits. Imagine waking up each morning feeling as if you were going to live a long and productive life. You take a brisk half-hour walk feeling as if you can tackle anything that comes your way. You eat a healthy breakfast that satisfies you until lunch. At work you focus easily as you knock off tasks one by one. At night you float off to sleep, as sure as anyone can be that your good fortune will continue. Why so confident? Because you've been tested for Syndrome X and you know you have it. But you are following the prevention program and have the problem well under control. You are on your way to preventing the damage to your coronary arteries caused by the syndrome. Things have never looked better. This scenario is quite realistic. There's no magic to it. Anyone can undergo the simple diagnostic tests for the syndrome, and anyone can get treatment. If you know what to look for, Syndrome X can be easily identified and effectively treated.